We create innovative and effective security solutions for the protection of people, property, critical assets and mission critical processes, which deliver real cost and operational benefits to our clients, on an enterprise wide scale. We use IP technology to enable companies to centralise the management and control of their security systems across the world, dramatically reducing the number of security and monitoring staff required on site, whilst at the same time improving the quality and quantity of security systems in place. software, as well as training and the best advice on how to implement and rollout your system. ● Proven integration expertise and toolsets. ● Proven skills on installation, support and embedding to our customers. ● Highly skilled team to enable product customization to fit customer needs. M2M technology is the utilization of different types of mechanical devices to establish a communication and exchange of information. 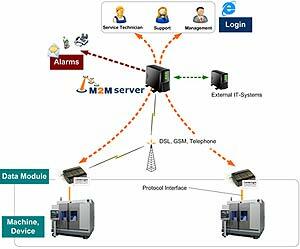 More properly known as machine to machine technology, the M2M interface allows businesses to monitor and manipulate remote equipment that is crucial to the business operation. This type of remote monitoring and control makes it possible for corporations to address service issues and restore functionality with little or not interruption in productivity.